I know that you’ve all already read the post title and know the contents … but excuse me while I flail as I explain it to you. Author interviews are always fun. Stressful for me (I mean, how do you come up with questions?? ), but fun. And to add to that, today I am interviewing CG FREAKIN DREWS. PAPERFURY. CAIT. YES, WHATEVER YOU KNOW HER AS. Not only is she a fantabulous – and my absolutely favorite – book blogger, but she is an author. Not one of those authors who are famous and try to write a book and we all grit our teeth and smile because honey, writing isn’t your thing. No. Cait is one of my absolutely favorite authors! 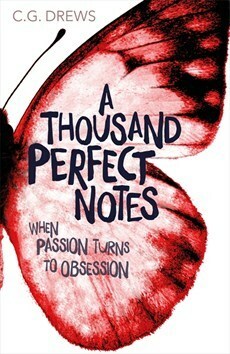 Last year Cait’s debut novel A Thousand Perfect Notes (Amazon, Goodreads, Book Depository) was published, and it was amazing. Loved it. It is beautiful – including the cover – and it comes from me with high recommendations. And in case you have been living in a rock for, oh I don’t know, FOREVER, then you should know that she’s publishing her second novel! April 4th! In 13 days! 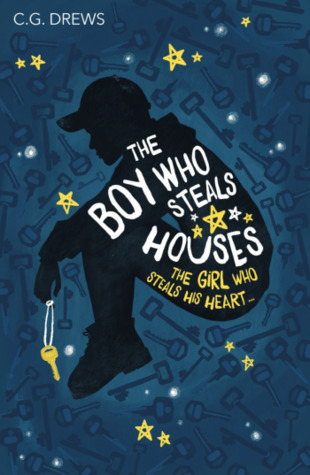 The Boy Who Steals Houses looks amazing … if not even better … than ATPN. I’m psyched! I’ve preordered it, but shipping from the UK takes forever. Still! If you have not preordered it… Do it! Now – after I shove ALL THE LINKS in your face … we shall carry on with the interview! Which, btw, mostly focuses on writing/writing process. You’re welcome. Honestly…it still feels surreal! I’ve been working towards and dreaming of being an author since I was 15, so being able to now pick up a shiny little paperback with my name printed on the cover??? I’m still freaking out with happiness! Can you (briefly) tell us your writing process for TBWSH and/or ATPN? For A Thousand Perfect Notes = I had a loose outline and took about ten days to come up with a scrubby first draft. It was my first attempt at YA contemporary so I had like 2% of a clue what I was doing. It went through three drafts before it caught Hachette UK’s eye and I signed a two-book deal! For The Boy Who Steals Houses = I had an intense outline and wrote it over a wild 3 days for NaNoWriMo in 2016! It ended up being my disaster kid and went through major rewrites before officially becoming my next published book. But it was a lot more fun to write because, while it’s still dark, I had more happy and silly moments compared to ATPN’s overall seriousness. Where does your motivation for writing come from amidst all the craziness of, well, everything? I’ve always desperately wanted to be published, so that’s the driving force behind how hard I work. And seriously there is nothing like getting to hold your own book for the first time and knowing all these neat lines of words are yours. Many writers are out there, struggling to feel like their stories matter. What would be a word of encouragement for them? It is sometimes hard to think our little stories will make an impact in a world already full of books, but they do. No one can tell your story like you can. And somewhere out there, a reader will call YOUR book their favourite. Write it for them to find. Shifting directions slightly, you’re a big name in the YA blogisphere. How do you deal with all of the pressure that that can create? I confess I don’t actually feel like a Big Name, haha. I still feel like a small flailing dork who just wants to talk about good books. But I do often feel pressured to keep putting out content, even when I’m super busy or super tired. Which is ridiculous, because everyone understands people need breaks! So learning to chill = something I’m still working on. Finally, and most importantly, on average, how much cake is consumed in your book-writing process? Okay, why don’t you head over to Cait’s blog and give her some love! Also, preorder The Boy Who Steals Houses (join me, my friends, in my eternal agony of waiting!)!!! Read ATPN! On average – for my writer folks out there – how much cake (or food) consumption is there when you are writing? Let us chat all the things down below! Yeah, I get what you mean! Can't wait to read her second book! 1000 perfect notes was amazing!